A long term stated goal of Greenstage has been to promote and develop open source technology. I thought this would play out significantly in the future, once we had the GS750V completed and racing. The immediate issues with our inverter are preventing the completion of the GS750V, interestingly they have also created an opportunity to bring our long term plans forward and hence solve our current problems. All in one go! As well as the open source technical design and development I am very aware of the importance of fostering and developing commercial manufacturing, testing, packaging and sales aspects of the resulting products. Without this the projects will become just another wad of information that only a small subset of people can make use of. The commercial entities supporting and bringing these open source products to market will provide consumers and OEM's with the opportunity to leverage these products with confidence. Combined with the long term technical benefits of open source development, this synergistic commercial manufacturing has the very real opportunity to create a strong and attractively priced set of products. To learn more about the Tumanako projects, visit our Tumanako Launch wiki page where you can see some of the presentations and photos from the evening. 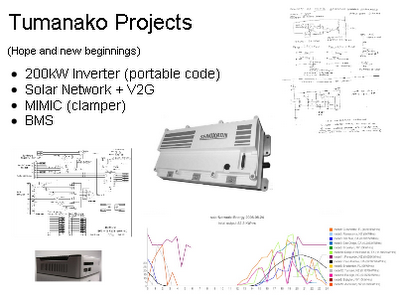 The Tumanako projects are being hosted on SourceForge and changes will be visible as development progresses. We already have a formidable team and this team will only grow and get stronger as the projects progress. If you have an interest in the outcome of these projects, or you would like to get involved, please let us know.